Patient Experience Week - How did you celebrate? How did you celebrate Patient Experience Week? View celebrations from PX Week 2017. "We had a fabulous time honoring our patients, their families and the employees that go above and beyond every day to make our patient's experiences wonderful. Some of the highlights included the daily staff and leadership challenges, a thank you party hosted by leadership for the patients and family members, our CEO's "Day in their shoes" being a patient, our wall of fame and a presentation on the last day of what our patients are saying about us that rewarded a few special employees who go above and beyond. Please feel free to use any of the above on your website. Overall, the week was very well received by the staff and we look forward to doing it again next year! Thank you for all the resources on your website." "This year, we really wanted to focus on celebrating the amazing staff who truly embody the patient experience each and every day! We had a week full of events to celebrate, reenergize and recognize the amazing work they all do. Most importantly, we wanted to convey to staff that each and every one of them is part of the patient experience! Monday: Keynote Speaker Mr. Marcus Engel shared his tremendous story that served as a reminder of why we do what we do, and how the tools of communication, compassion and caring make all the difference. As a college freshman, Marcus Engel was blinded and nearly killed after being struck by a drunk driver. Through years of rehab, more than 350 hours of reconstructive facial surgery and adaptation through a multitude of life changes he experience firsthand the good, the bad, the ugly and the extraordinary of patient care. Tuesday: Dogs from our pet therapy program visiting all three lobby areas throughout the hospital to visit with patients and staff. Wednesday: Our Integrative Medicine Practice graciously donated the time (and hands) of a massage therapist to spend 3 hours doing free chair massages for staff. Thursday: We hosted an ice cream social for staff to come grab a sweet treat, take a photo in our photo both and enjoy a time out from their work. We also had treats delivered to our offsite locations and to night shift staff members. 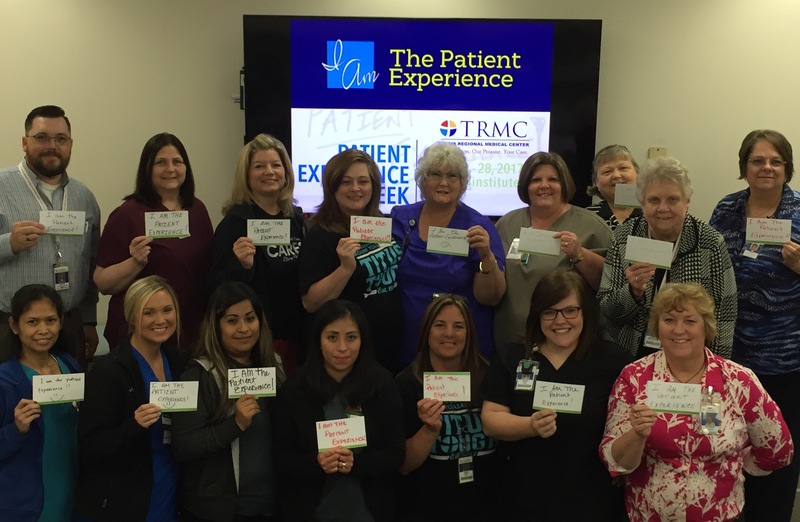 Friday: We hosted a Patient Advisory Council Awareness Day where current Patient Advisory Councils promoted the work they’ve done in their specific areas to patients and staff." "Erlanger CWW3 are all the Patient Experience. And Shout Out to Bayhealth for sharing their puzzles! At Erlanger we had a drawing each day for a 25$ gift card if I pulled your puzzle from the prize box." 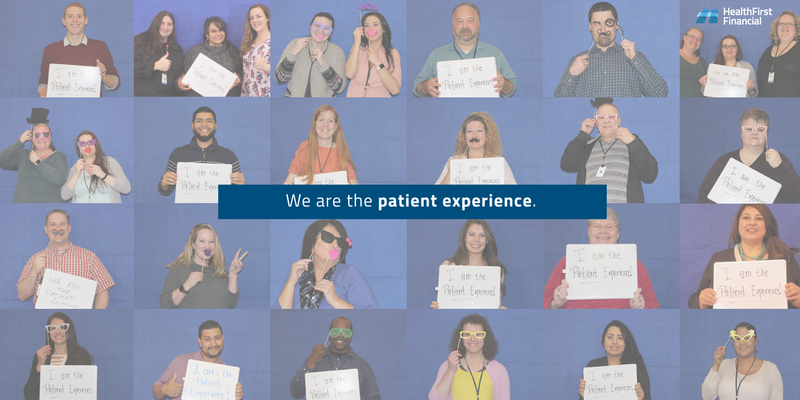 "Here at HealthFirst Financial, we spent Patient Experience Week connecting with each other and discussing what patient experience means to us. Patients deserve exceptional service, and we're so grateful to have the opportunity to enhance their overall experience. We also had some fun with our photo booth! Thank you for creating this online event and energizing the healthcare world!" 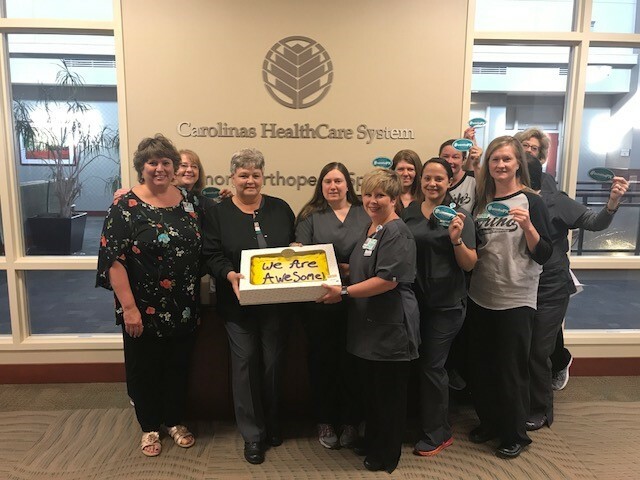 "We wanted to share with you our most popular post during our online celebration that highlighted a very special healthcare employee-Margaret. Margaret’s daughter was a terminally ill patient at Cincinnati Children’s Hospital Medical Center and she used our services while living at the hospital. Now she’s a patient concierge with our company!" "Here is our Patient Experience week agenda for one of our facilities along with some photos." 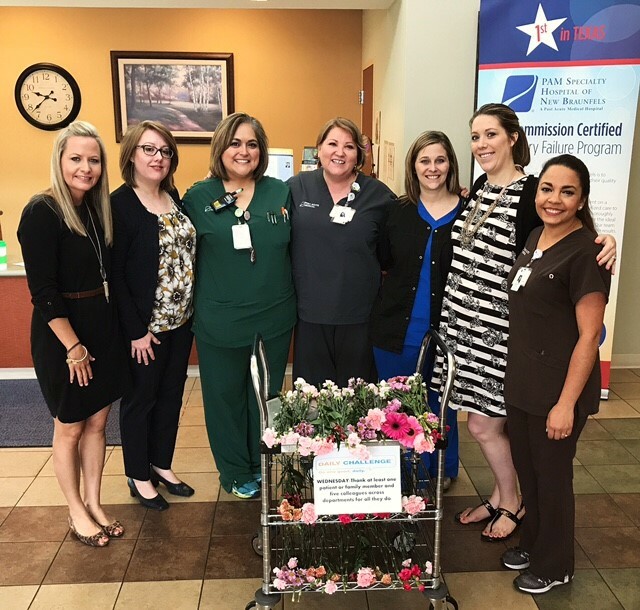 "FOR PATIENTS - We celebrated Patient Experience week by giving out flowers to discharging patients all week (given out by our front desk Patient Ambassadors). FOR STAFF – On Thursday, our Patient Experience staff started at 5:30AM at entrance of the staff parking garage, with a sign that said “YOU ARE the Patient Experience” and “Happy Patient Experience Week”, giving out Tootsie Rolls in a bag that said “Great Service is How we ROLL – 2017 Patient Experience Week” and a Sticker that said “I AM the Patient Experience”. 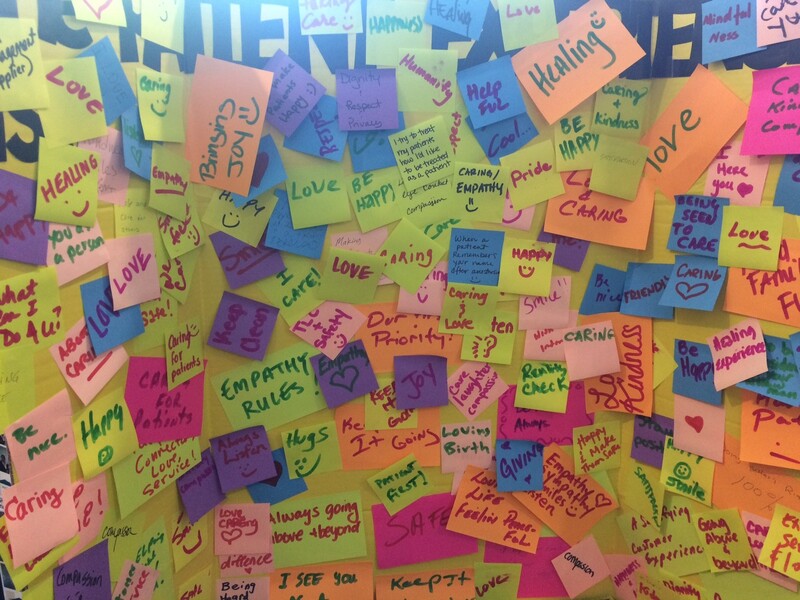 Then all day in the Cafeteria, employees came and wrote what they thought the “The Patient Experience is…” and took a photo in the photo booth, in order to get an “I am the Patient Experience” water bottle. It uplifted the energy in the entire hospital. For Night Shift & Off-Sites we brought them boxes of mini cupcakes with Patient Experience week information, thanking them for all that they do. " Each day of the week, there was a color for teammates to wear and a way to celebrate the teammates! Each hospital had a different fair, from “caring for the caregiver day” to “I am the patient experience” (pictures attached) These days included pet therapy, GetWell interactive activities, patient give-aways, massage, blessing of the hands and many other activities! 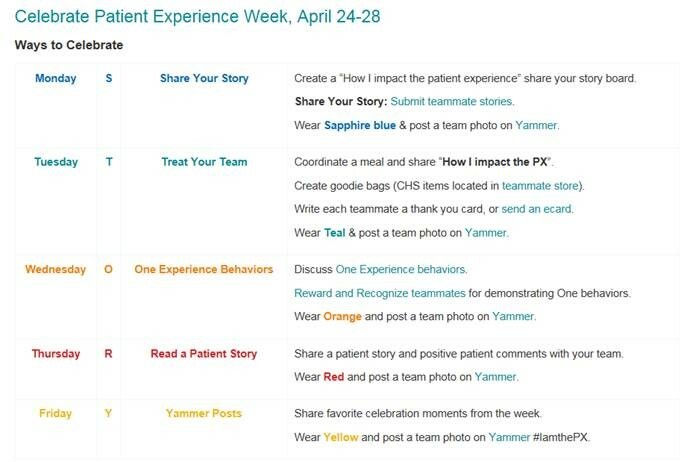 Teammates were also encouraged to share their story throughout the week on our internal website and all activities and celebrations were posted on our internal social media platform, Yammer with #iamthePX #PXWeek2017"
"At UFHealth Shands we celebrated by promoting the week by wearing our PX tee shirts. We also used the templates provided on the Beryl Institute website to create customizable Patient Experience stickers and cards. We plan to hand these out throughout the year to team members who we would like to celebrate for creating an exceptional patient experience. Thank you for providing such excellent resources to help us celebrate." "Here are our PX Week celebrations across UnityPoint Health." 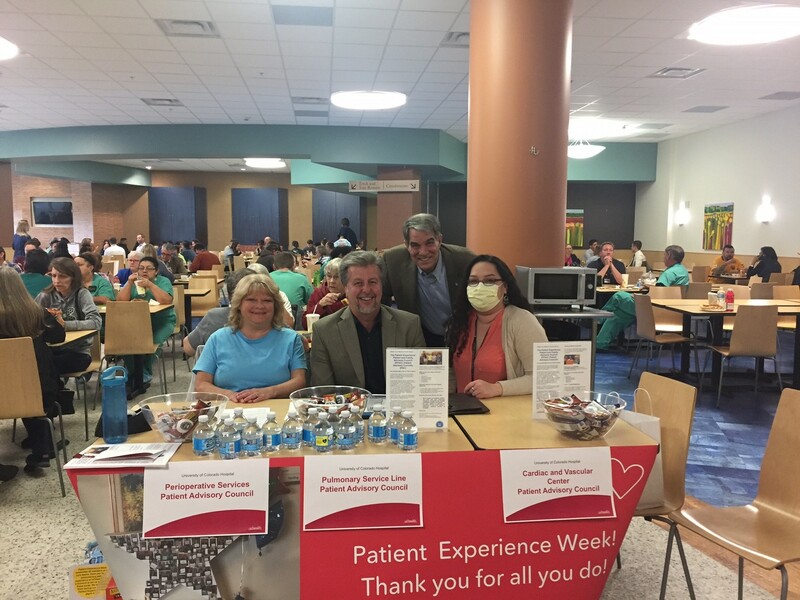 "At UHS Chenango Memorial Hospital, we celebrated Patient Experience Week. All employees were offered the opportunity to complete a word search and were entered into a drawing for a Dunkin' Donuts gift card. We also had a Patient Experience Poster contest. The staff were instructed to make a poster of what the Patient Experience means to them. Attached are the 10 posters that were turned in. We gave a food prize for 1st, 2nd and 3rd place. It was fairly well received for our first attempt at celebrating The Patient Experience Week. I look forward to a bigger celebration next year!" 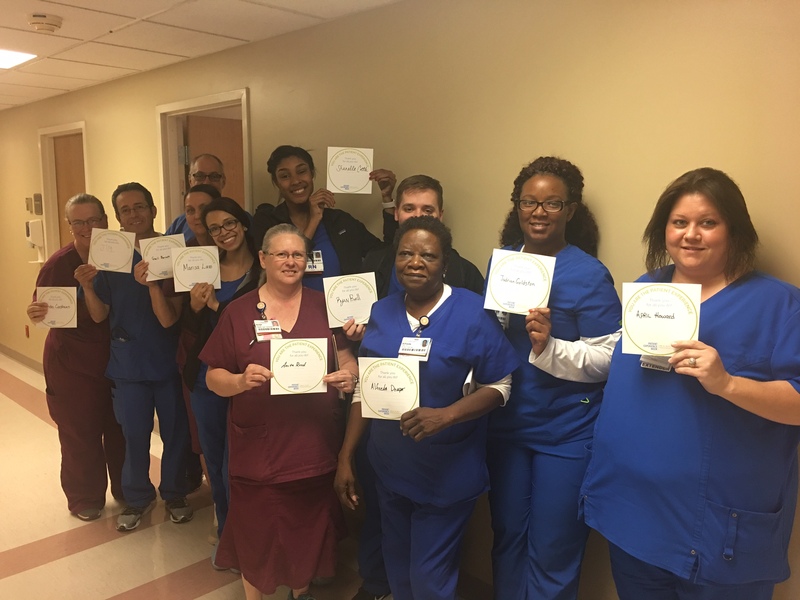 "At Hamilton Medical Center in Dalton, Georgia, we incorporated our PX into our wellness challenge. 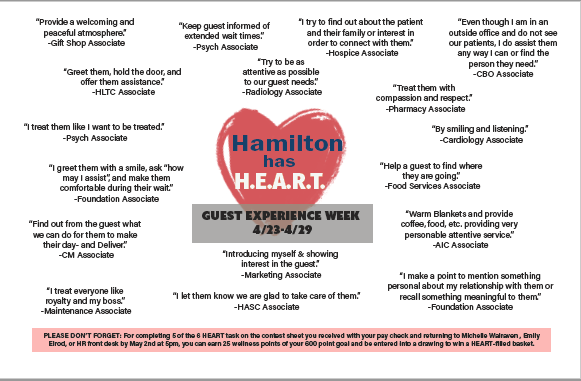 We offered 25 wellness points with the completion of five of the six activities listed on “Hamilton has H.E.A.R.T” contest. Our associates were given a H.E.A.R.T card that listed six activities they could participate in for the points. The activities included: “Say this phrase to at least one guest, “We’re going to take great care of you.”, “Say hello to 10 people within the first two hours of your day.”, “Take a self-break (take a walk outside, take 10 deep breathes, or take a moment to smile)”, “Deliver an uplifting note to someone or fill out a HEART card for someone you want to thank for their service”, “Tell us how you create a memorable experience for your guests”, and “Think about the SHOW – pick up every piece of trash you see on the way to your next meeting or appointment”. Our ongoing wellness challenge encompasses mind, body, and spirit, so what better way to promote mind and spirit wellness than to celebrate our guests (patients). The photos attached include our drop box for the H.E.A.R.T cards, what our H.E.A.R.T cards looked like, associates participating in our “Hamilton has H.E.A.R.T contest (pictures are from our gift shop and HR Dept. ), and an email that was sent out hospital wide with comments written on H.E.A.R.T cards with how associates have created memorable moments for our guests. It has been an honor to participate in PX week." "Children’s Hospital of Philadelphia celebrated Patient and Family Experience Week with several events and activities! The week started off with a Family-Centered Care Grand Rounds, where several CHOP leaders and families presented on how to help improve communication amongst colleagues, patients and families that will lead to a safer and better overall care experience. Later in the week, we hosted the “I am the CHOP Experience” Selfie Exhibition, where staff were invited to take a selfie in a photo booth and post their photos to the CHOP Wall of Fame! Finally, as a thank you for their contribution to the CHOP Experience, we offered healthy snacks throughout the CHOP campus and network to employees." "Our wonderful team at A3i makes a positive difference in a patient’s life, every day. We are committed to transforming patient connections into conversations. Each time we do so, we acknowledge the heart reinforcing a focus on healing and a commitment to well-being. Thank you for inspiring the Patient Experience Week. We are excited to share with you the celebrations we held both internally and at local health systems and physician offices in our community. We hope our stories below fuel your passion to improve “The Patient Experience. We at A3i also visited True health Medical center and Florida Hospital Emergency to say how thankful we are to them for making patients healthier every day. And give out a gift boxes with coloring sheets we created specifically for this event so children (or adults J) in the waiting room have something fun to share. "Check out our photo album from VNAHG PX heroes!! We also enjoyed visiting the nurse association health group!" 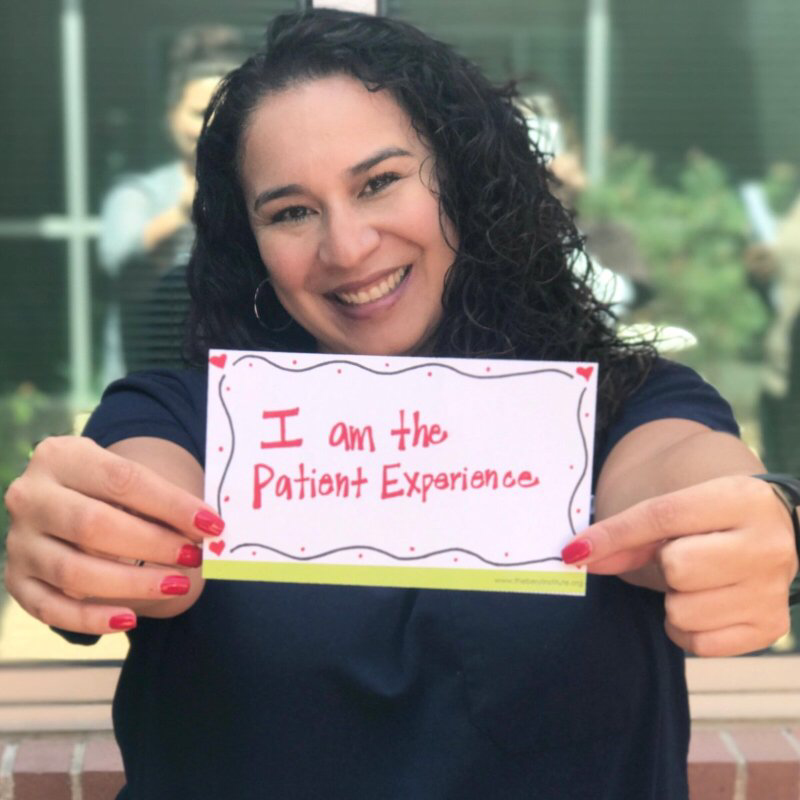 "For Patient Experience Week, we created videos highlighting 10 of our Employees Who Make a Difference!" "We had an amazing Patient Experience Week at Arkansas Children’s Hospital!!" "Sven, the facility dog at Children’s Hospital & Medical Center in Omaha, wears his “I am the Patient Experience” t-shirt to kick off Patient Experience Week!" "We love our t-shirts! This is our PX team."" "St Joseph Warren Hospital, Mercy Health Youngstown got the week started with a poster contest." "Our Patient Services team has been celebrating Patient Experience week this week for the first time – and loving it." 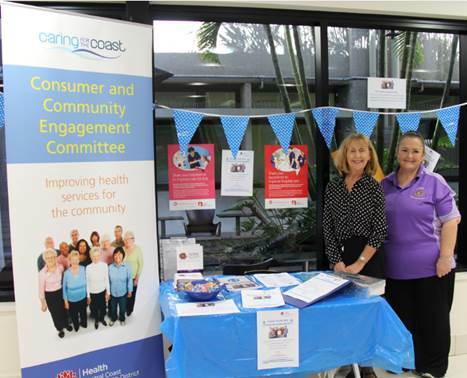 "We have had an information stand at the foyer of Gosford hospital for patients, carers, visitors and staff. People are in invited to ‘have your say’, which could be in a number of ways. Doreen an Aboriginal Health Worker assisted me with the stand, also members of the Consumer and Community Engagement Committee came along to support and give a hand." 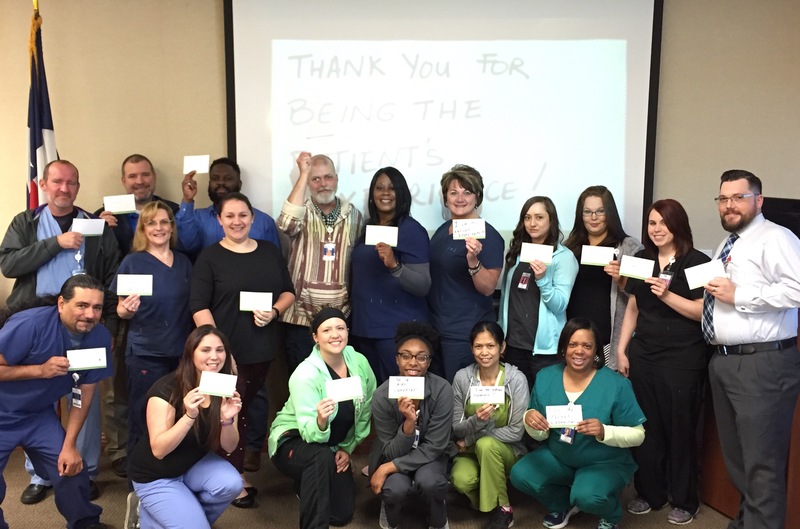 "We celebrated by giving our employees light up bouncy balls and cookies with the attached message that says: Your efforts help light up patient lives."